Did I have you at C-3PO marshmallows? Yup, me too. It’s going to be the most epic holiday season ever for Star Wars fans. Star Wars Episode VII arrives in theaters this December, and all of my Star Wars nerdiness is jumping for joy. Why? Because I’m bringing the hot cocoa and DIY C-3PO Marshmallows. Can we say BEST holiday gifting ever? I know! 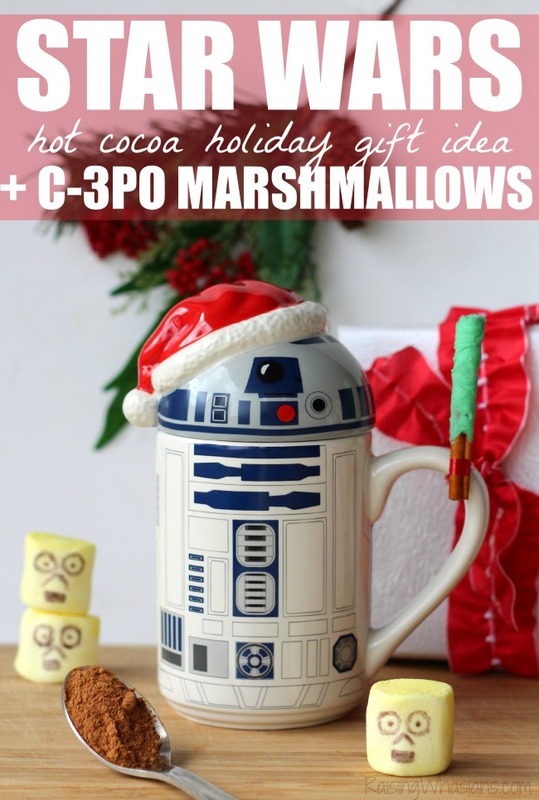 So today we’re kicking up the holiday gifting to a galaxy far far away kind of level with my Star Wars Hot Cocoa Holiday Gift Idea + DIY C-3PO Marshmallows. Combine and place those ingredients in a seal-able bag. Easy peasy. Be sure to tell your gift giver to add their favorite hot milk (or soy, etc) to their cup and stir in the mix for a tasty homemade hot chocolate! Melt your white chocolate in small microwaveable bowl (or over the stove if preferred). Add a drop of green food coloring and mix to create your Jedi green color. Dip your cinnamon stick about 3/4 of the way into the chocolate mixture. Allow to cool and harden on wax paper. 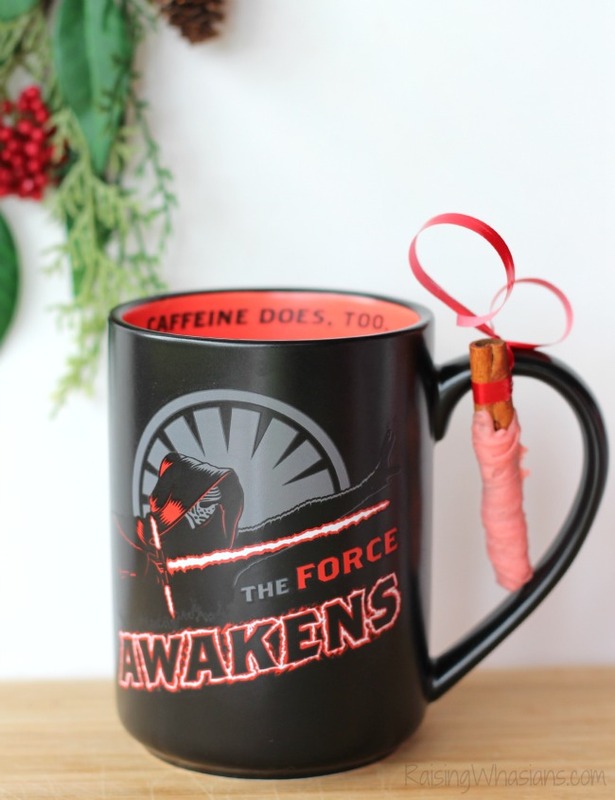 What’s a Star Wars themed hot cocoa gift idea without an epic mug to put it in? But this is not just any holiday mug, folks. 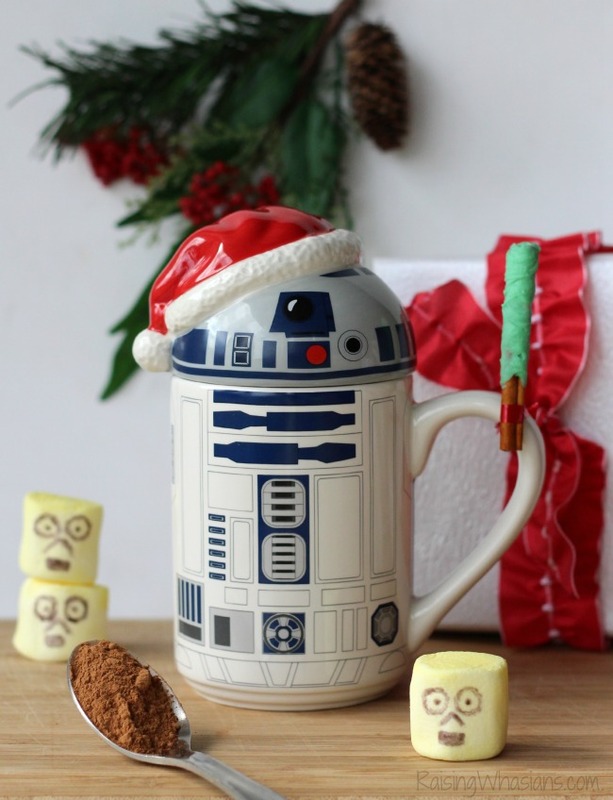 No, this special holiday R2D2 mug sings for joy. Oh yes! 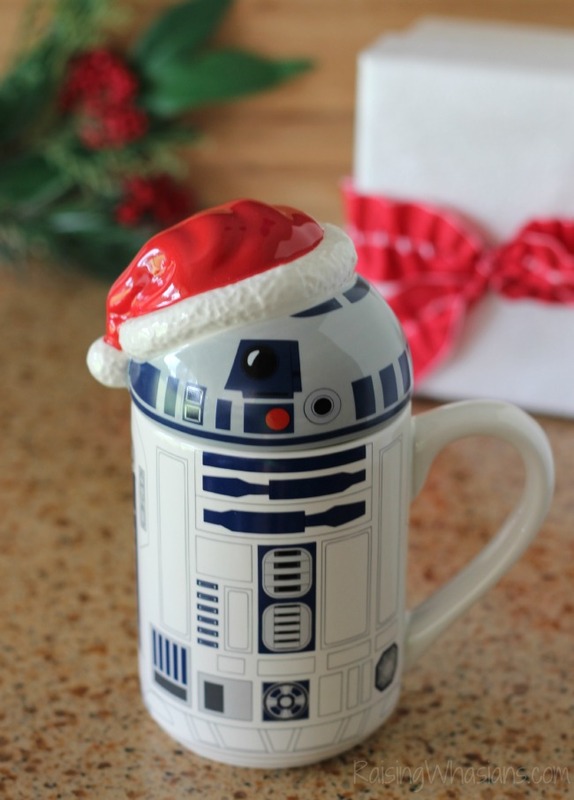 Remove the lid and hear R2D2 sing a special version of jingle bells as you sip your hot cocoa. So cool! And guess what? Your one-of-a-kind Star Wars™ R2-D2™ Mug with Sound can only be found at Hallmark. I heart that place, don’t you? They have all of the fun holiday gift ideas this season, including a full section of Star Wars memorabilia! How cool is this new Kylo Ren mug for Episode VII? We have hot cocoa. We have a lightsaber. We have R2D2. No dynamic Star Wars duo is complete without C-3PO! 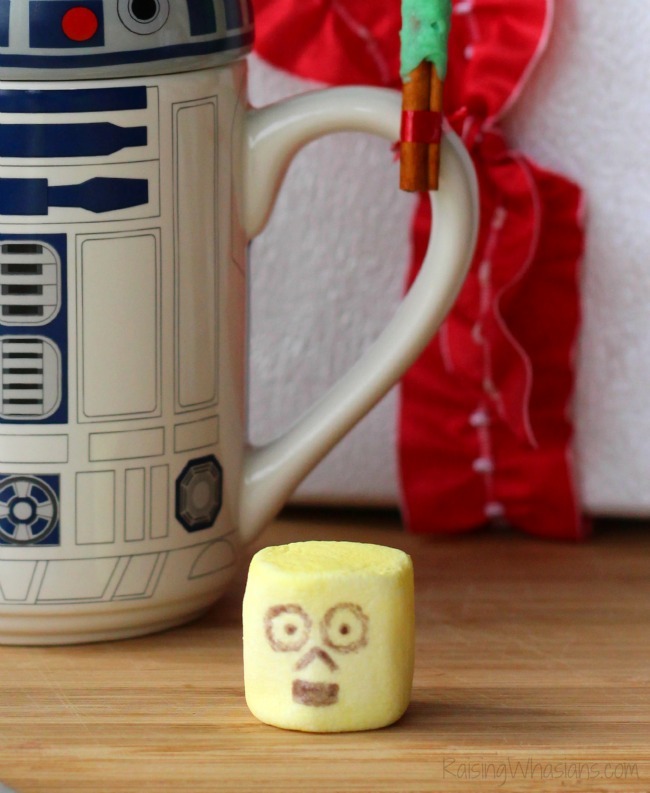 As a crowning touch to your epic Star Wars Holiday Gift Idea, we have to have C-3PO marshmallows. So let’s make those! 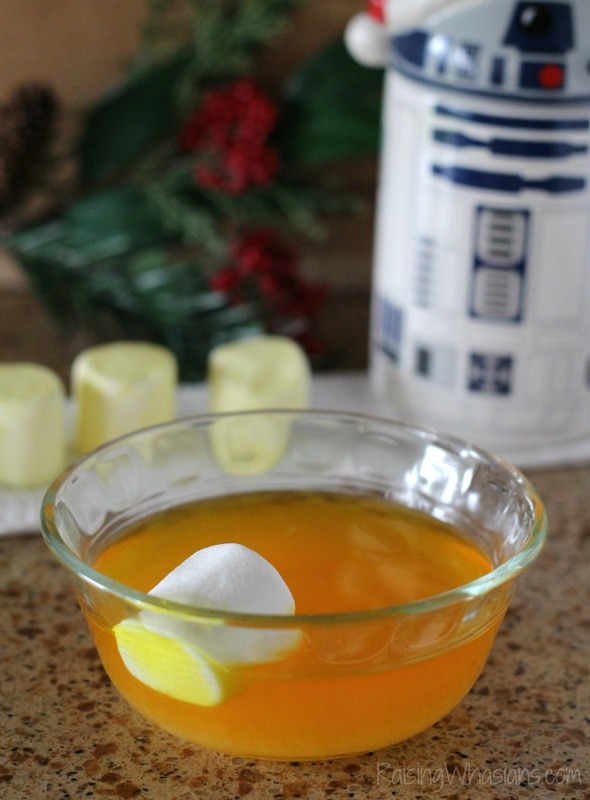 In a small bowl of water, add a few drops of yellow food coloring until you get your desired “golden” C-3PO color. Using a spoon, submerge your marshmallows for a few seconds until completely covered in the yellow dye. 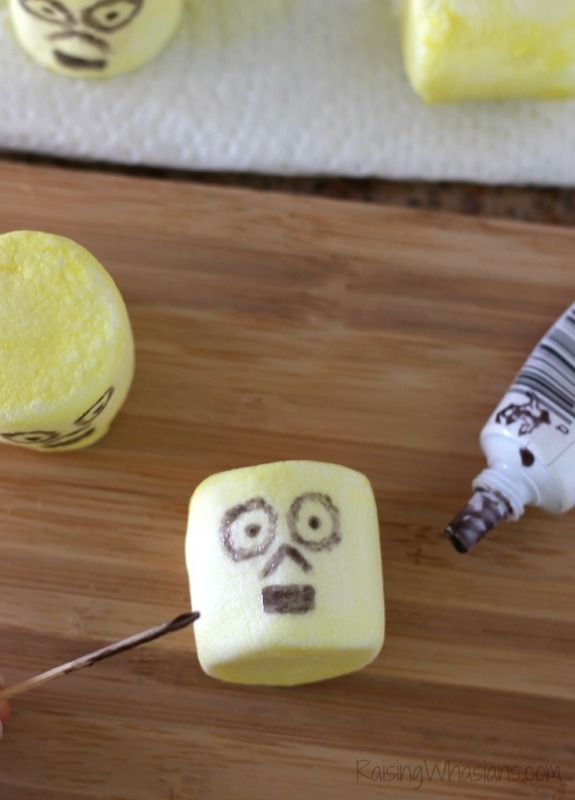 When completely dry, draw a C-3PO face onto one side of the marshmallow like so using your black icing gel and a toothpick. Allow to dry. Place your adorable marshmallows into a seal-able bag, alongside your homemade hot cocoa, cinnamon stick lightsaber and your epic R2D2 mug. Check out my video above to see how to put this whole gift idea together (including R2D2 singing jingle bells!). You now have the perfect Star Wars Holiday Gift, just in time for the Episode VII release! 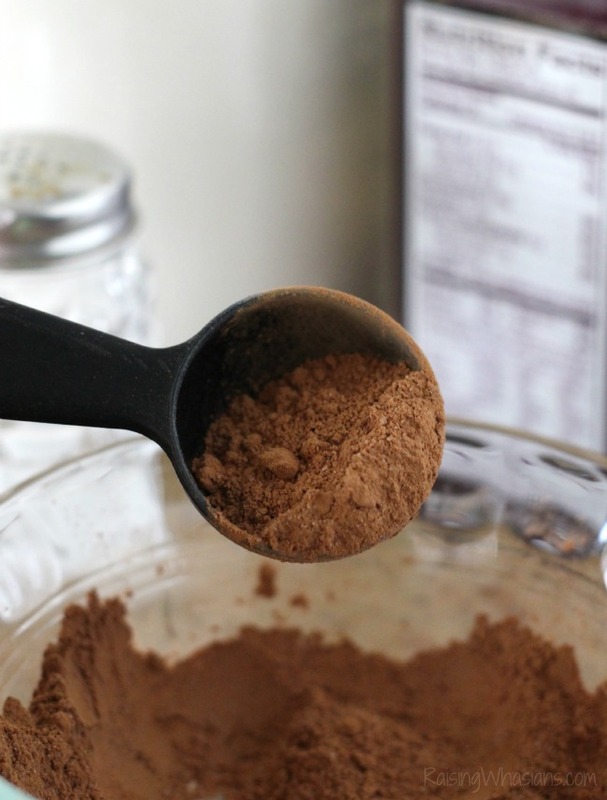 Homemade hot cocoa mix. A lightsaber cinnamon stir stick. C-3PO Marshmallows. And of course, an awesome R2D2 mug from Hallmark to tie it all together. Take your Star Wars gifting to a galaxy far far away this holiday season with this Star Wars Themed Hot Cocoa Set.Be sure to look for your favorite Star Wars Holiday Gifts and Holiday Cards at Hallmark to make this the most epic holiday season ever! 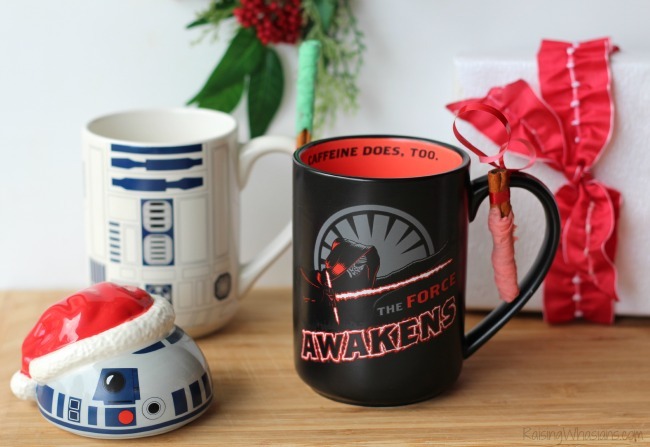 Who would love a Star Wars Themed Hot Cocoa Set this holiday season? Be sure to follow Raising Whasians via Facebook, Twitter, Google, Instagram, Pinterest and YouTube for more of your favorite DIY craft ideas, recipes and more! That is such a cute idea. C-3P is one of my favorite characters. I love this! Where has this been all my life!?! I want- no NEED every piece of the hallmark collection? (ok maybe not the cubes) Such a great idea. I may have to do this just for a viewing party to prep for December. I think my Daughter’s first theater movie will be The Force Awakens 😀 I’m pretty stoked about it. This whole post is super cute! My husband is a HUGE fan. I need to make him those C-3PO marshmallows. I have an edible marker that I’m sure will work great on them instead of the food coloring. Mugs with sound? That is too cool! I also love the lightsaber stir sticks you made. I admit, I have never seen a single episode of Star Wars. 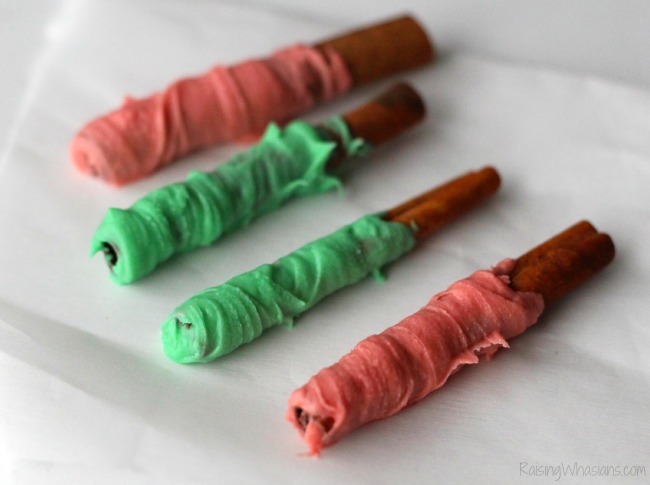 However, my daughter’s bf is a HUGE fan, so I should make him some of those marshmallows and saber sticks this holiday! Yum! 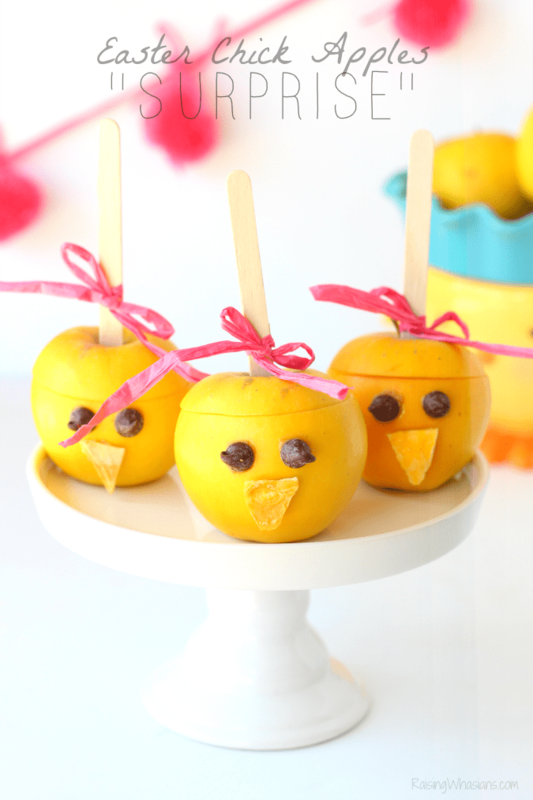 This is such a cute gift idea. I know all the kids in the family are hyped for the new movie. This is such a cute idea. I think my son would enjoy this for a gift this holiday season. Omgosh these are all so perfect for my step father!! He is such a huge star wars fan and my son and I can make a lot of these together!! Thank you for the great ideas!! I’m sure my husband would love this idea, he will definitely like this, thank you so much for idea. This is very cute and a really great gift for Star Wars fans. Such a great idea! Lots of Star Wars fans, and this would make a great gift. The marshmallows are so cute! I think a lot of people would love these Star Wars ideas! I would love to make homemade hot cocoa mix. This is a great idea. I’m going to try this. I don’t think I’ve ever tried it homemade. What a fun idea for Star Wars fans! I love the little face on the marshmallows! This would be a cute gift for a star wars fan. Very creative and thoughtful. The biggest Star Wars fan in the house right now is my daughter. And that brings my husband so much joy! I can’t wait to make these for them both. What a creative gift! I know a few Star Wars fans that would love this. hahah you’re adorable! “i know, super cute!” …i seriously said it in my head as you were saying it! haha great picks Christie! That is too great! Yum! We are huge Star Wars fans in this house! I love this idea! Thanks so much for giving me something to try for my grandchildren and hubby. He is the biggest kid of them all! That is such a super cute idea!!! I love the Star Wars theme! My brother is a Star Wars fanatic. This post reminds me of him. He would love that R2-D2 mug!! I never thought Star Wars and Christmas goes together! I love it and I actually want a Hot Cocoa set for myself! This is the coolest idea for Star Wars fans! I will have to make the marshmallows soon for my family. You can vary them into so many well-loved characters! The only thing missing is having the Star Wars Christmas special playing in the background. I’ve never actually seen it, at this point it’s basically a “you had to be there” moment. This is perfect! So cute! Several people on my list are huge Star Wars fans. What a great gift idea! My brother in law would love this!